$380.00 M 1955 Tuzhurka dress tunic for an Infantry Major, 1955-58. A very uncommon and distinctive uniform from the brief "Marshal Zhukov Era". Small size, in outstanding condition. $280.00 M 1955 Tuzhurka or "Land Forces Officer Dress Coat" for an Artillery captain, 1956-58. Uncommon survivor of the short-lived Zhukov uniform reforms. $65.00 Soviet Army Sergeant's and Enlisted Man's field uniform jacket. Size 46-2, 1977 dated, in excellent unissued condition. $90.00 Unissued Soviet Navy Full Dress "Navy Uniform #1, summer parade, for officers, warrant officers and extended service personnel": white wool jacket and trousers complete with a pair of unissued gold bullion parade uniform shoulder boards and two rank stars - sufficient to complete a uniform as worn by a Captain, Third Rank, C 1980s. $95.00 Winter Tenlnyashka Striped Shirt, Extremely scarce ORIGINAL Soviet Navy issue, circa 1980s. In excellent, almost new condition. $75.00 Soviet Army Winter Camouflage Suit to wear over regular uniform, dated 1965. In excellent unissued condition and includes original carrying bag. $50.00 KZS net camouflage suit, dated 1979. Pants and smock in loose fitting cotton burlap. Outstanding early war display piece, in top condition. $6.00 OMON sleeve badge, 1970s-80s. 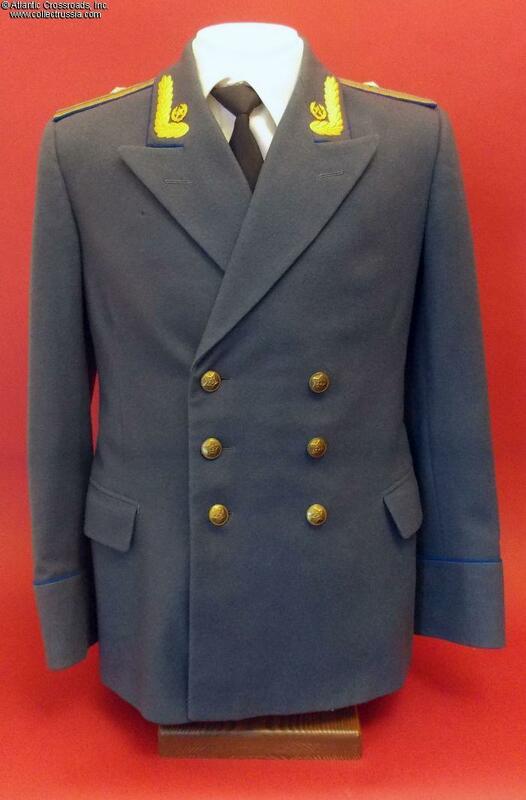 $33.00 Officer dress aiguillette circa 1970s-80s. A hard to find item to complete a parade uniform. Excellent unissued condition.